Summary: Arguments against the use of logistic regression due to problems with “unobserved heterogeneity” proceed from two distinct sets of premises. The first argument points out that if the binary outcome arises from a latent continuous outcome and a threshold, then observed effects also reflect latent heteroskedasticity. This is true, but only relevant in cases where we actually care about an underlying continuous variable, which is not usually the case. The second argument points out that logistic regression coefficients are not collapsible over uncorrelated covariates, and claims that this precludes any substantive interpretation. On the contrary, we can interpret logistic regression coefficients perfectly well in the face of non-collapsibility by thinking clearly about the conditional probabilities they refer to. Wait, who said logistic regression was fucked? “It is problematic to interpret [logistic regression coefficients] as substantive effects, because they also reflect unobserved heterogeneity. 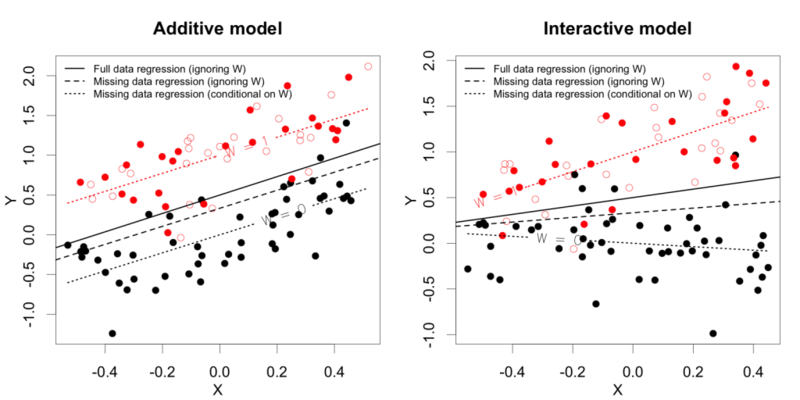 It is problematic to compare [logistic regression coefficients] across models with different independent variables, because the unobserved heterogeneity is likely to vary across models. These are pretty serious allegations.3 These concerns have convinced some people to abandon logistic regression in favor of the so-called linear probability model, which just means using classical regression directly on the binary outcome, although usually with heteroskedasticity-robust standard errors. To the extent that’s a bad idea—which, to be fair, is a matter of debate, but is probably ill-advised as a default method at the very least—it’s important that we set the record straight. The allegations refer to “unobserved heterogeneity.” What exactly is this unobserved heterogeneity and where does it come from? There are basically two underlying lines of argument here that we must address. Both arguments lead to a similar conclusion—and previous sources have sometimes been a bit unclear by drawing from both arguments more or less interchangeably in order to reach this conclusion—but they rely on fundamentally distinct premises, so we must clearly distinguish these arguments and address them separately. The counterarguments I describe below are very much in the same spirit as those of Kuha and Mills (2017). This leads the probability of given to take the form of a Normal CDF, with mean and standard deviation a function of , , and the deterministic threshold . So the probit model is basically motivated as a way of estimating from this latent regression of on , although on a different scale. This latent variable interpretation is illustrated in the plot below, from Thissen & Orlando (2001). 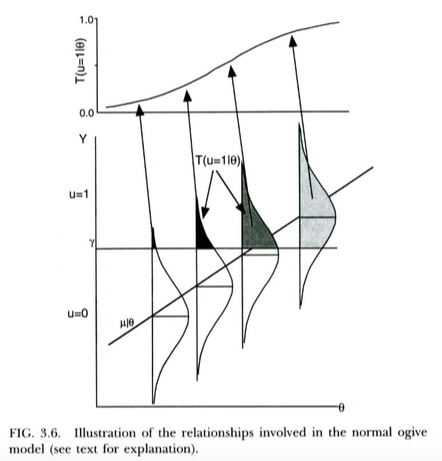 These authors are technically discussing the normal ogive model from item response theory, which looks pretty much like probit regression for our purposes. Note the differences in notation: these authors use in place of , in place of , in place of , in place of , and they write probabilities with instead of the usual or . We can interpret logistic regression in pretty much exactly the same way. The only difference is that now the unobserved continuous follows not a normal distribution, but a similarly bell-shaped logistic distribution given . A theoretical argument for why might follow a logistic distribution rather than a normal distribution is not so clear, but since the resulting logistic curve looks essentially the same as the normal CDF for practical purposes (after some rescaling), it won’t tend to matter much in practice which model you use. The point is that both models have a fairly straightforward interpretation involving a continuous latent variable and an unobserved, deterministic threshold . So the first argument for logistic regression being fucked due to “unobserved heterogeneity” comes from asking: What if the residual variance is not constant, as assumed in the model above, but instead is different at different values of ? Well, it turns out that, as far as our observable binary outcome is concerned, this heteroskedasticity can be totally indistinguishable from the typically assumed situation where is constant and is increasing (or decreasing) with . This is illustrated in Figure 2 below. Suppose we are comparing the proportions of positive responses (i.e., ) between two groups of observations, Group 1 and Group 2. To give this at least a little bit of context, maybe Group 2 are human subjects of some social intervention that attempts to increase participation in local elections, Group 1 is a control group, the observed binary is whether the person voted in a recent election, and the latent continuous is some underlying “propensity to vote.” Now we observe a voting rate of 10% in the control group (Group 1) and 25% in the experimental group (Group 2). In terms of our latent variable model, we’d typically assume this puts us in Scenario A from Figure 2: The intervention increased people’s “propensity to vote” ( ) on average, which pushed more people over the threshold in Group 2 than in Group 1, which led to a greater proportion of voters in Group 2. The problem is that these observed voting proportions can be explained equally well by assuming that the intervention had 0 effect on the mean propensity to vote, but instead just led to greater variance in the propensities to vote. 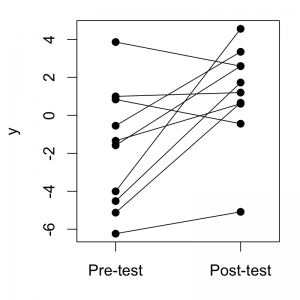 As illustrated in Scenario B of Figure 2, this could just as well have led the voting proportion to increase from 10% in the control group to 25% in the experimental group, and it’s a drastically different (and probably less appealing) conceptual interpretation of the results. 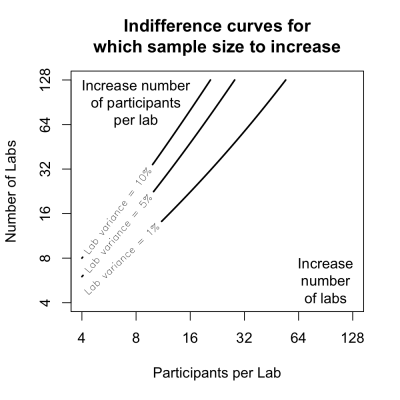 Another possibility that would fit the data equally well (but isn’t discussed as often) is that the intervention had no effect at all on the distribution of , but instead just lowered the threshold for Group 2, so that even people with a lower “propensity to vote” were able to drag themselves to the polls. This is illustrated in Scenario C of Figure 2. So you can probably see how this supports the three allegations cited earlier. When we observe a non-zero estimate for a logistic regression coefficient, we can’t be sure this actually reflects a shift in the mean of the underlying continuous latent variable (e.g., increased propensity to vote), because it also reflects latent heteroskedasticity, and we can’t tell these two explanations apart. And because the degree of heteroskedasticity could easily differ between models, between samples, or over time, even comparing logistic regression coefficients to one another is problematic…if shifts in the underlying mean are what we care about. Are shifts in an underlying mean what we care about? It makes any conceptual sense to think of the observed binary as arising from a latent continuous and a deterministic threshold. We actually care how much of the observed effect on is due to mean shifts in vs. changes in the variance of . We’ve observed only a single binary indicator of , so that Scenarios A and B from Figure 2 are empirically indistinguishable. In my experience, usually at least one of these is false. For example, if the observed binary indicates survival of patients in a medical trial, what exactly would an underlying represent? It could make sense for the patients who survived—maybe it represents their general health or something—but surely all patients with are equally dead! Returning to the voting example, we can probably grant that #1 is true: it probably does make conceptual sense to think about an underlying, continuous “propensity to vote.” But #2 is probably false: I couldn’t care less if the social intervention increased voting by increasing propensity to vote, spreading out the distribution of voting propensities, or just altering the threshold that turns the propensity into voting behavior… I just want people to vote! Finally, when #1 and #2 are true, so that the investigator is primarily interested not in the observed but rather in some underlying latent , in my experience the investigator will usually have taken care to collect data on multiple binary indicators of —in other words, #3 will be false. For example, if I were interested in studying an abstract like “political engagement,” I would certainly view voting as a binary indicator of that, but I would also try to use data on things like whether that person donated money to political campaigns, whether they attended any political conventions, and so on. And when there are multiple binary indicators of , it then becomes possible to empirically distinguish Scenario A from Scenario B in Figure 2, using, for example, statistical methods from item response theory. These counterarguments are not to say that this first line of argument is invalid or irrelevant. The premises do lead to the conclusion, and there are certainly situations where those premises are true. If you find yourself in one of those situations, where #1-#3 are all true, then you do need to heed the warnings of Allison (1999) and Mood (2010). The point of these counterarguments is to say that, far more often than not, at least one of the premises listed above will be false. And in those cases, logistic regression is not fucked. Okay, great. But we’re not out of the woods yet. As I mentioned earlier, there’s a second line of argument that leads us to essentially the same conclusions, but that makes no reference whatsoever to a continuous latent . In the special case where is uncorrelated with , we know that , so that our estimate of the slope for will, on average, be the same either way. The technical name for this property is collapsibility: classical regression coefficients are said to be collapsible over uncorrelated covariates. It turns out that logistic regression coefficients do not have this collapsibility property. If a covariate that’s correlated with the binary outcome is omitted from the logistic regression equation, then the slopes for the remaining observed predictors will be affected, even if the omitted covariate is uncorrelated with the observed predictors. Specifically, in the case of omitting an uncorrelated covariate, the observed slopes will be driven toward 0 to some extent. This is all illustrated below in Figure 3, where the covariate is shown as a binary variable (color = red vs. blue) for the sake of simplicity. Figure 3. 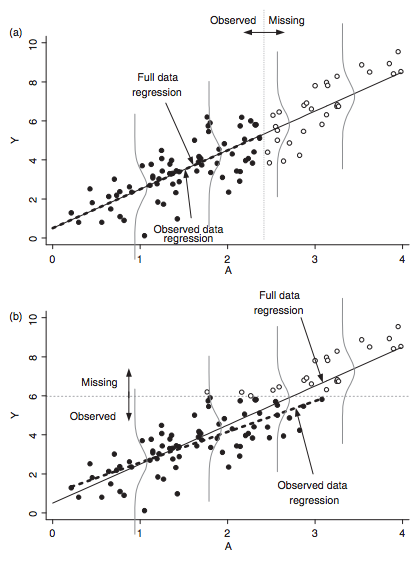 In the classical regression case, the simple/unconditional regression line (black) has the same slope as the group-specific regression lines (red and blue). In the logistic regression case, they are not equal: the simple/unconditional regression line is much more shallow than the group-specific regression lines. In both cases there is no confounding: the predictor X and the grouping factor (color = red vs. blue) have zero correlation, that is, X has the same mean among the red points and the blue points. So now we can lay out the second line of argument against logistic regression. Actually, the most impactful way to communicate the argument is not to list out the premises, but instead to use a sort of statistical intuition pump. 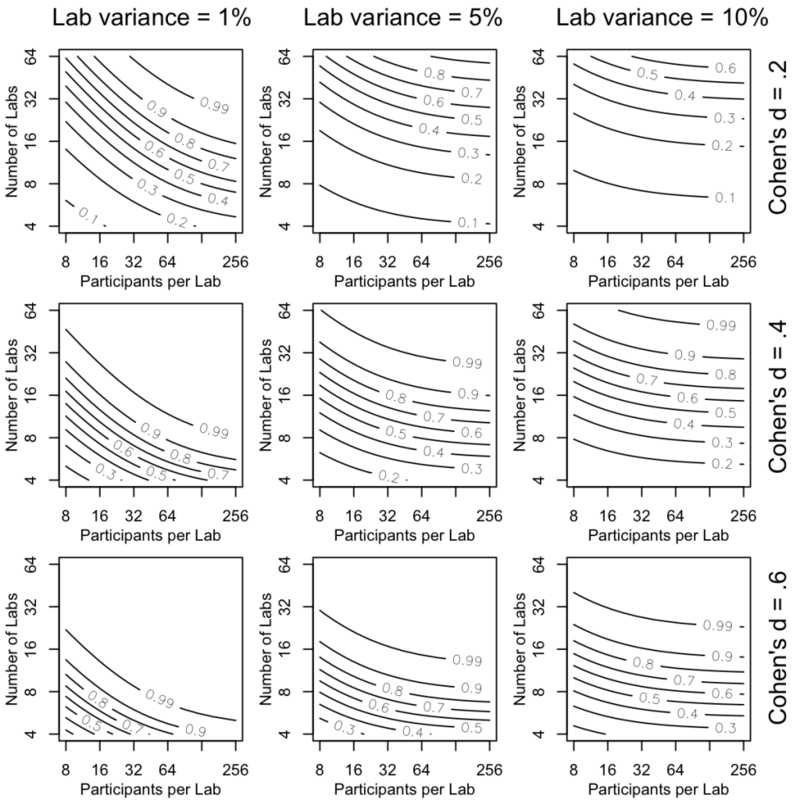 Consider the data in the right-hand panel of Figure 3. The slope (logistic regression coefficient) of on is, let’s say, for both the red group and the blue group. But suppose the color grouping factor is not observed, so that we can only fit the simple/unconditional logistic regression that ignores the color groups. Because of the non-collapsibility of logistic regression coefficients, the slope from this regression (shown in black in Figure 2) is shallower, say, . But if the slope is among both the red and the blue points, and if every point is either red or blue, then who exactly does this slope apply to? What is the substantive interpretation of this slope? For virtually every logistic regression model that we estimate in the real world, there will be some uncorrelated covariates that are statistically associated with the binary outcome, but that we couldn’t observe to include in the model. In other words, there’s always unobserved heterogeneity in our data on covariates we couldn’t measure. But then—the argument goes—how can we interpret the slopes from any logistic regression model that we estimate, since we know that the estimates would change as soon as we included additional relevant covariates, even when there’s no confounding? These are rhetorical questions. The implication is that no meaningful interpretation is possible—or, as Mood (2010, p. 67) puts it, “it is problematic to interpret [logistic regression coefficients] as substantive effects.” I beg to differ. As I argue next, we can interpret logistic regression coefficients perfectly well even in the face of non-collapsibility. where is the logit link function. As the left-hand-sides of these regression equations make clear, tells us about differences in the probability of as increases conditional on the covariate being fixed at some value , while tells us about differences in the probability of as increases marginal over . There is no reason to expect these two things to coincide in general unless , which we know from probability theory is only true when and are conditionally independent given —in terms of our model, when . So now let’s return to the red vs. blue example of Figure 3. We supposed, for illustration’s sake, a slope of overall, ignoring the red vs. blue grouping. Then the first rhetorical question from before asked, “who exactly does this slope apply to?” The answer is that it applies to a population in which we know the values but we don’t know the values, that is, we don’t know the color of any of the data points. There’s an intuition that if among both the red and blue points, then for any new point whose color we don’t know, we ought to guess that the slope that applies to them is also . But that presupposes that we were able to estimate slopes among both the red and blue groups, which would imply that we did observe the colors of at least some of the points. On the contrary, let me repeat: the slope applies to a population in which we know the values but we don’t know any of the values. Put more formally, the slope refers to changes in ; there is an intuition that these probabilities ought to equal , but these are not the same because the latter still require conditioning on . The second rhetorical question from above asked, “how can we interpret the slopes from any logistic regression model that we estimate, since we know that the estimates would change as soon as we included additional relevant covariates, even when there’s no confounding?” The answer is that we interpret them conditional on all and only the covariates that were included in the model. Again, conceptually speaking, the coefficients refer to a population in which we know the values of the covariates represented in the model and nothing more. There’s no problem with comparing these coefficients between samples or over time as long as these coefficients refer to the same population, that is, populations where the same sets of covariates are observed. As for comparing coefficients between models with different covariates? Here we must agree with Mood and Allison that, in most cases, these comparisons are probably not informative. But this is not because of “unobserved heterogeneity.” It’s because these coefficients refer to different populations of units. In terms of models A and B from above, and represent completely different conceptual quantities and it’s a mistake to view estimates of as somehow being deficient estimates of . As a more general rule, parameters from different models usually mean different things—compare them at your peril. In the logistic regression case, there may be situations where it makes sense to compare estimates of with estimates of , but not because one thinks they ought to be estimating the same quantity. 1 Or which, at least, are not fucked for the given reasons, although they could still be fucked for unrelated reasons. 2 This stuff is also true for some survival analysis models, notably Cox regression. 3 At least, I think they are… a definition of “substantive effects” is never given (are they like causal effects? ), but presumably they’re something we want in an interpretation. Allison, P. D. (1999). Comparing logit and probit coefficients across groups. Sociological methods & research, 28(2), 186-208. Kuha, J., & Mills, C. (2017). On group comparisons with logistic regression models. 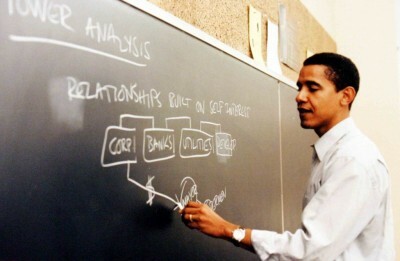 Sociological Methods & Research, 0049124117747306. Pang, M., Kaufman, J. S., & Platt, R. W. (2013). Studying noncollapsibility of the odds ratio with marginal structural and logistic regression models. Statistical methods in medical research, 25(5), 1925-1937. Rohwer, G. (2012). Estimating effects with logit models. NEPS Working Paper 10, German National Educational Panel Study, University of Bamberg. Thissen, D. & Orlando, M. (2001). Item response theory for items scored in two categories. In D. Thissen & Wainer, H. (Eds. ), Test Scoring (pp. 73-140). Mahwah, NJ: Lawrence Erlbaum Associates, Inc.
You’ve likely heard that the flooding in Houston following Hurricane Harvey is reportedly a 500-year or even 1000-year flood event. You’ve perhaps also heard that this is the third 500-year flood that Houston has experienced in a three-year span, which calls into serious question the usefulness or accuracy of the “500-year flood” designation. This made me wonder: what’s our actual best estimate of the yearly risk for a Harvey-level flood, according to the data? That is the question I will attempt to answer here. As a spoiler, I estimate that Harvey caused roughly 50 – 120 year flood events at most sites in Harris county (the Texas county where Houston is located) where we have data—but the estimates depend strongly on the specific site, with estimates at some sites being unremarkably small, and estimates at one site (Vince Bayou at Pasadena, TX) indeed hovering near the 1000 year neighborhood. In the rest of this post I will describe how I arrived at these estimates. I’ve posted an R Markdown HTML document which gives all the code for reproducing this analysis, plus some additional tidbits. Disclaimer: I am not a hydrologist. In fact, I know almost nothing about hydrology. What I am is an out-of-work data scientist. I don’t claim that the analysis I present below is particularly savvy or sophisticated — it’s possible I’ve overlooked some issues that would be more obvious to the hydrologically initiated — but I do think my analysis at least addresses all or most of the major methodological issues that need to be handled in such an analysis. As the sources I linked above explain very clearly, the N-year flood is a probabilistic notion based on the estimated chance that flood waters will reach a certain height in any given year. In a nutshell, an N-year flood is defined as the flood water height that a given area has a 1/N probability of reaching in a particular year. For example, a 500-year flood has a probability 1/500 or 0.2% chance of occurring in a particular year, by definition. Now, it does not automatically follow that an N-year flood is expected to occur about every N years on average, but that conclusion does follow if we add the somewhat reasonable assumption that the flood events are independent from one year to the next1. That assumption is probably not exactly true, due to factors like El Niño / La Niña cycles (or Atlantic Niño in Harvey’s case), but probably a good enough approximation that the intuitive interpretation “500-year floods are expected every 500 years” is reasonably true. Now, it would be fantastically unlikely for Houston to experience three 500-year floods in three years if these were “truly” 500-year floods. A much more likely explanation is that the underlying risk estimate — 0.2% chance of occurring in a year — is based on a bad statistical model. We can use the historical stream gage2 height data from the U.S. Geological Survey (USGS; see also Harris county, TX’s very nice interface) to come up with a better estimate. Query the USGS web server to retrieve the last 20 years of gage height data from all stream gage sites in Harris County, TX. 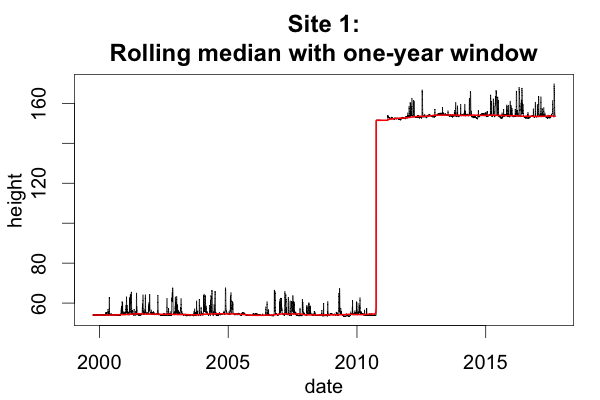 Detrend the data using a one-year rolling median. Convert the daily risk estimates to N-year flood estimates by making some assumptions about the form of temporal dependence. 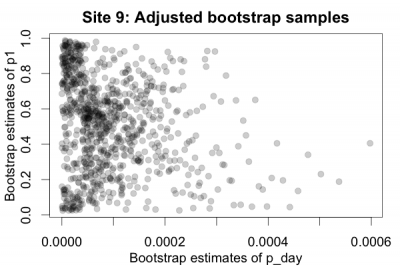 Bootstrap to obtain estimates of uncertainty. Retrieving the data is not too exciting, so I won’t say much about it in this summary post other than to point out the USGS Daily Values Web Service, which is a really nice system the USGS has set up for retrieving nicely formatted data via HTTP requests. (For those interested in this sort of thing, all the details and syntax are documented in the R Markdown document.) Instead we’ll jump ahead to the part where we have a nice, clean dataset. Figure 1: The raw data. It mostly looks pretty well-behaved, with the obvious exception being some huge, discontinuous jumps in gage height that appear at some of the sites. The top 6 sites show the biggest jumps ; as you can see, these are all (and the only ones) from Cypress Creek. I have no idea what went down at Cypress Creek to cause these discontinuities, or why the jumps don’t at least all happen at or around the same time. In principle what we care about in measuring these flood levels are the deviations from the typical stream heights, whatever those typical heights might be at that time, even if they have changed over the years (whether that’s through a slow drift or a big change all at once). In other words, we are interested in the detrended data. Plus, more practically speaking, we want to be able to still use the data prior to those discontinuous jumps in stream height that we saw above. One way or another, that requires accounting for the jumps by detrending them out. A rolling median is a good candidate method for a nonparametric estimator of the trend line here because (a) it won’t be affected much by big, sudden shocks to the gage height (e.g., from floods), thereby leaving that variability to go into the CDF, which we want; and (b) in theory, a rolling median can model the discontinuous jumps much better than, say, a rolling mean because the median is not a “smooth” statistic like the mean is. There is the question of the optimal window width for the rolling median (i.e., how many observations to take the median over in each direction). One idea would be to regard this as a hyperparameter to be tuned via cross-validation, but note that in this case minimizing the expected prediction error is not really our goal. Rather, our goal is to remove the biggest, coarsest trends in the data, while leaving all of the variability around that trend line in the data so that it will go into the estimated CDF. The trend line that minimizes the expected prediction error would actually follow the data a bit too closely for our purposes, getting pulled upward by large flood events and thereby eating up some of the variability that we want to keep. In other words, we want the trend line to underfit the data to some extent. Figure 2: Black lines = data, Red line = rolling median trend line. Looks great! The trend line remains relatively flat even in the presence of large local floods, but still perfectly captures the weird discontinuous jump in the time series as well as any very slow drifts over time. Figure 3: The detrended data. It looks pretty good! There are a handful of odd downward spikes that are probably the result of the median line not capturing the discontinuous jumps as gracefully as possible, but these seem small enough not to worry about. This step is pretty straightforward, at least thanks to the sROC package, which has nice functionality for kernel estimation of CDFs. 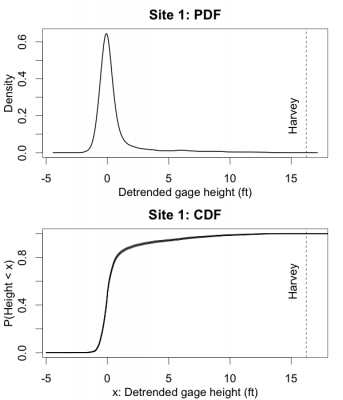 Here’s an example of what the probability density function (PDF) and CDF look like for one representative site, and where the Harvey floods fall in this distribution. Figure 4: Estimated PDF and CDF for one site. Okay, so now we can look up the Harvey flood in the CDFs for each site, which will tell us the proportion of the distribution that is less than the Harvey flood. Let one minus this proportion be , the probability of a flood at least as great as Harvey on a particular day. Note that it’s for a particular day, not a particular year, because our data are daily gage heights. Now we just need to convert this to , the probability for a particular year, and then take to obtain the N-year flood estimate. So how do we do the conversion? 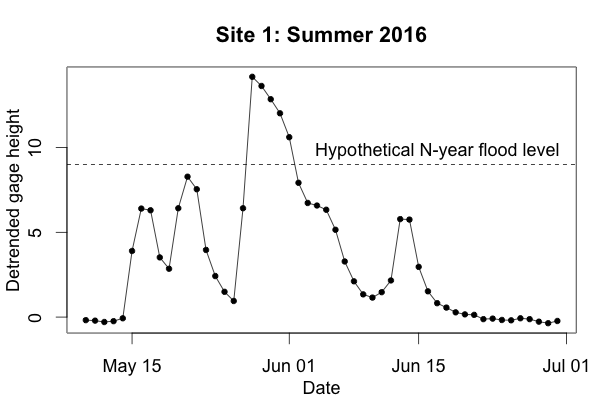 Figure 5: Gage data from Summer 2016 flooding near Houston. There are five N-year flood days in a row. I drew a hypothetical flood height level to represent a particular N-year flood, just for illustrative purposes (I have no idea what flood level this line would actually correspond to). We can see that in this particular case, we had a string of five N-year flood days in a row. More generally, this should make it clear that we expect the daily flood events to be dependent in that they tend to come in clusters. So to convert to for Harvey, we need a model of this dependence. which reduces to the previous formula when , meaning the events are independent. Figure 6: N-year flood estimates each of the 21 sites, as a function of the dependence ( ) assumptions. As you can see, the assumed value of doesn’t have a huge impact until it gets up to around, say, 0.6 or so, but then it starts to matter quite a lot. To think about what plausible values of might be, it helps to notice that, according to our dependence model, flood durations follow a Geometric distribution with parameter , implying that the expected flood duration is days. So, for example, when , then we expect it to take an average of 4 days before water levels recede to below the relevant N-year flood level (but not necessarily back to normal levels). 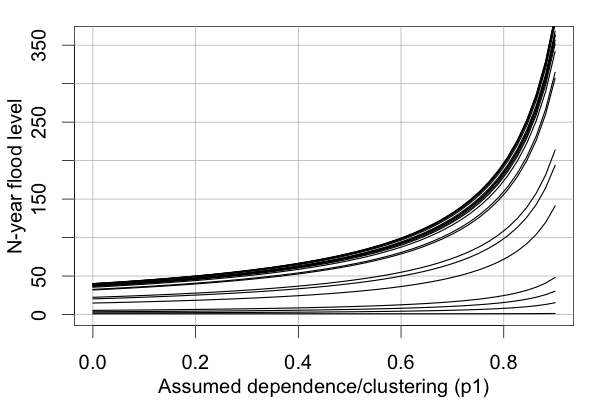 Figure 8: Dependence/clustering ( ) estimates for each of the 21 sites, as a function of the flood height ( ) in quantile units. 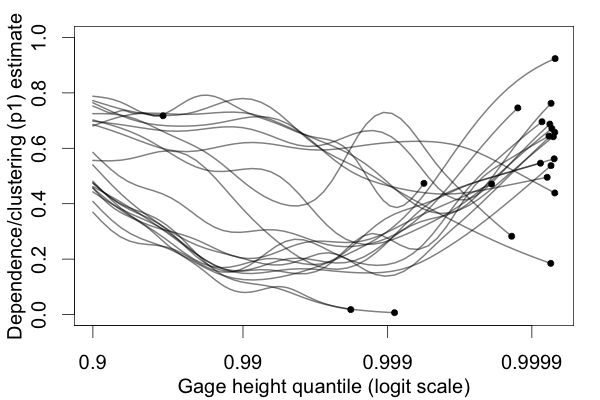 The estimates are predictions from a weighted GAM fit to the simple estimates (in logit-logit space) that result from the procedure illustrated by Figure 7, with weights proportional to the number of data points below . The right end-points of each curve are the flood quantiles at which Harvey is located for that site; note that these are equal to . Immediately we see that there is considerable variation across gages in their level of dependence, and that the degree of dependence depends on the flood height (in an interesting, non-monotonic way). Because the estimates depend fairly strongly on the site and on the height of flooding, it wouldn’t be a good idea to use an aggregate estimate that averages across all sites and/or all flood heights. Instead, for our N-year flood estimates we will use each site’s individual estimate at the value corresponding to the Harvey flood height at that site. We now have point estimates of and for all sites, which means we could technically now compute our N-year flood estimates for each site. But to use only the point estimates would be to ignore the substantial uncertainty associated with these estimates! Furthermore, because we obtain the N-year estimates from a convex transformation of and , using only the point estimates would lead us to systematically underestimate the N-year flood levels (due to Jensen’s inequality). 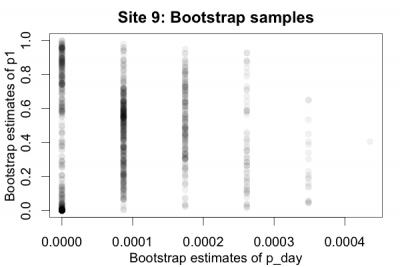 So we will use bootstrapping to preserve the variability of the estimates. Figure 11. Left panel: Dependence/clustering ( ) estimates as a function of the flood height ( ) in quantile units. Green line = Estimates from the actual dataset, Black/gray lines = Estimates from 1000 bootstrap-resampled datasets. 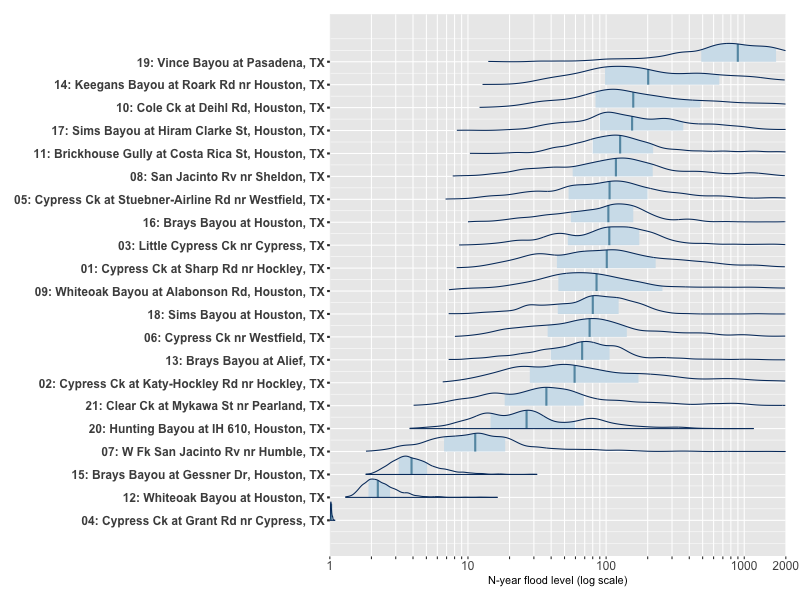 Right panel: Density of bootstrap estimates at the uppermost flood quantile (the quantile where the Harvey floods are). 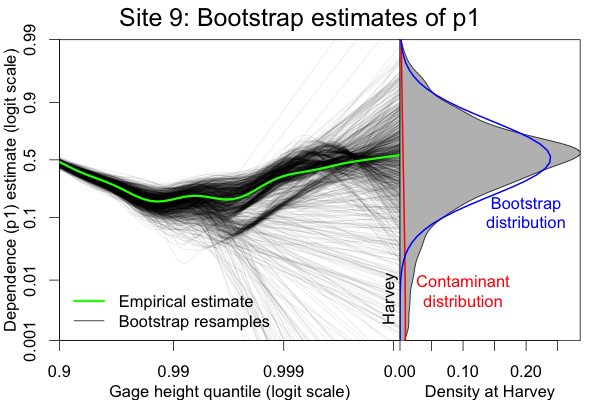 Blue/red lines = Estimates from Gaussian mixture model separating the “true” bootstrap distribution from contaminant/divergent estimates. Recall from the Figure 8 caption that the estimates are predicted values from a weighted GAM fit (on the logit-logit scale) to the simple estimates resulting from the procedure illustrated Figure 7, because the simple estimates are rough and unstable, particularly at extreme values of the flood height . Basically what is happening here is that, for a nontrivial minority of the bootstrap-resampled datasets, the simple estimates become empirically undefined (i.e., they involve division by zero) above a certain value of , because by chance the resampled dataset ended up with no data points near or beyond that value of . So when that happens, the GAM simply does a linear extrapolation from the highest non-missing to the value corresponding to Harvey, and uses the extrapolated value as the bootstrap estimate. That works fine in a lot of cases, but in other cases it can yield wacky/divergent estimates, depending on where along the sequence the simple estimates become missing. It seems like a good idea to discard the divergent bootstrap estimates. 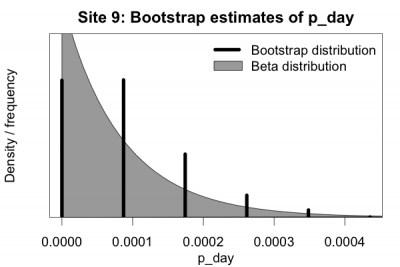 One way to do this is to fit a mixture model to the bootstrap estimates, use the model to classify each estimate as either probably coming from the “true” bootstrap distribution or probably coming from a (much wider) contaminant distribution, and then to discard the estimates classified as probably being contaminants. That process is illustrated in the right panel of Figure 11, which shows that it works pretty well, at least in the sense that the mixture model seems pretty plausible. Figure 12. Compare to Figure 9. Figure 13. Final bootstrap distributions for all sites. 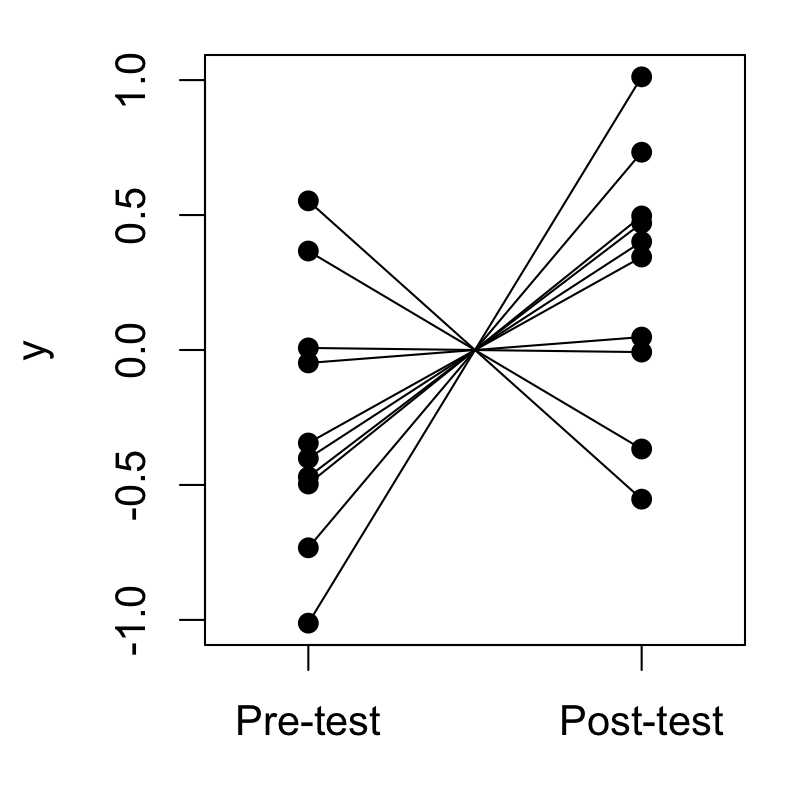 Lines = medians, shaded regions = 50% highest posterior density (HPD) intervals. As you can see, most of the N-year flood estimates have a lot of uncertainty around them. Estimating the risk of extremely rare events is an inherently hard statistical problem, so it’s not surprising that it’s hard to pin down precise estimates. Of course, the method I’ve applied here is just one way to approach the problem. Basically it’s the first thing I thought of. I initially intended this to be a rough-and-ready analysis to satisfy my curiosity, but after following the rabbit hole of Markov dependence and bootstrapping complications a bit further than I anticipated, I’m not so sure if the “rough-and-ready” description is still apt. This method I used here does not take into account the fairly obvious possibility that the yearly risk of Harvey-level flood events may not be constant, but instead may be increasing over time. Including such time-dependence in the model would make this already difficult statistical problem even more challenging. This increasing-risk hypothesis is certainly plausible, but is quite complicated to think about because it depends on a lot of factors, such as the rate and nature of current/future urban development in the Houston area, preparatory measures that may be taken up by Houston, the possibly increasing frequency of large hurricanes due to climate change, etc. Regarding this last point, it seems that the evidence for an increasing frequency of Category 4/5 hurricanes is rather mixed. where is the probability mass function for a Geometric distribution. On average, this exceeds when is less than about 0.35 or so, and by quite a lot when H is rare. 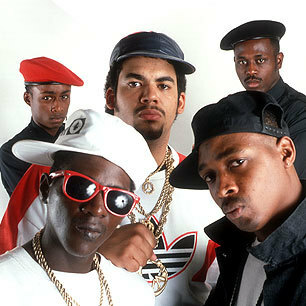 For example, if , then , so that the estimates overstate the probability of heads by almost a factor of 5 on average. This is not exactly what’s going on in our Harvey analysis, but it’s quite similar. It’s hard to know what to do (if anything) about this kind of selection bias, but it’s interesting to think about. 2 The USGS consistently uses the spelling “gage” instead of the more familiar (to me) “gauge.” Your guess as to why is as good as mine. Anyway, I’ll follow the USGS’s spelling convention. 3 Note that I use the daily means here, even though arguably it might make more sense to use the daily maximums. But unfortunately the daily maximums are only available for 3 of the gages in Harris county. 4 See the R Markdown document for the derivation of this. 5 The first step of the transformation—transforming the observed distribution to a Uniform distribution—is achieved in this case by taking , where is the number of values, and breaking ties randomly so that the 6 unique values become a smooth distribution. If you’re reading this, you probably know that missing data can cause a lot of problems in a data analysis, from reduced efficiency at best to seriously mistaken conclusions at worst. You may even be able to recite the technical definitions of Rubin’s three types of missing data. Those definitions are all well and good, but if you’re like me, you don’t necessarily have such an easy time applying that knowledge to concrete data situations and determining how to proceed. What parameters (such as regression coefficients or population means) can I recover—meaning construct estimates that are consistent with what we would get with no missing data—by just analyzing the non-missing cases (i.e., listwise deletion)? This is called ignorable missingness. For missingness that is ignorable, which auxiliary variables should I condition on (e.g., statistically adjust for or include in an imputation model), and which should I actually avoid conditioning on? This approach works so well because causal graphs are all about deducing which observed variables should be conditionally independent given which other variables—and it so happens that Rubin’s theory of missing data is naturally phrased in terms of conditional independencies. There’s a lot to say about DAGs… frankly too much to fit in one tutorial-style blog post. For a crash course in what they are and how the work, I’d recommend the resources listed here. In the interest of keeping this post as concise as possible, I’ll assume you either have some prior familiarity with DAGs or that you’ve perused some of the crash course material I just referenced, but I will at least provide brief reminders about key concepts as they are needed. 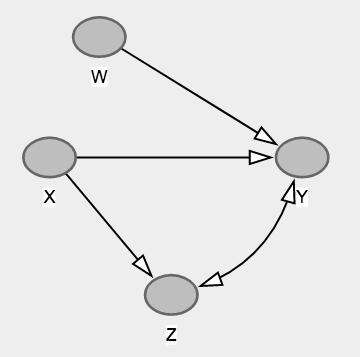 W causes Y independently of X. The missingness in X is directly caused by the (partially observed) values of X itself. An example of this would be if high-income respondents to a survey were less likely to disclose their incomes specifically because they didn’t want their high income to be known. In other words, high values are missing because they are high values. In Rubin’s terminology, X is missing not at random (MNAR). Now that we’ve laid out our assumptions about how missingness is related to the relevant observed and unobserved variables, we can apply relatively simple graphical criteria to help answer the kinds of questions I laid out near the beginning of this post. These criteria are due to the amazing work of Karthika Mohan and colleagues (see References). Here I’m only going to focus on the conditions for recovering regression coefficients, but this research also lays out criteria for recovering the full joint, conditional, or marginal distributions of all variables in the graph. Y (the outcome) cannot directly cause (or vice versa, although that would be strange). For simplicity, the figure considers a crude missing data mechanism where the observation is simply removed if it exceeds some fixed value (i.e., truncated). In the top panel (a), the missingness depends directly on the value of the predictor A. Despite this, we can still recover the slope simply by analyzing the complete cases. In the bottom panel (b), the missingness depends directly on the value of the outcome Y. As the figure shows, this has a distorting influence on the slope which precludes the consistent recovery of the regression coefficient. Y is d-separated from the missingness nodes by the predictors . Recall that two nodes A and B are d-separated by C if conditioning on C blocks all open paths between A and B (keeping in mind that colliders act “in reverse”: colliders block open paths unless they are conditioned on). If Condition 2 is satisfied, then we can recover the regression of Y on simply by analyzing the non-missing observations at hand. 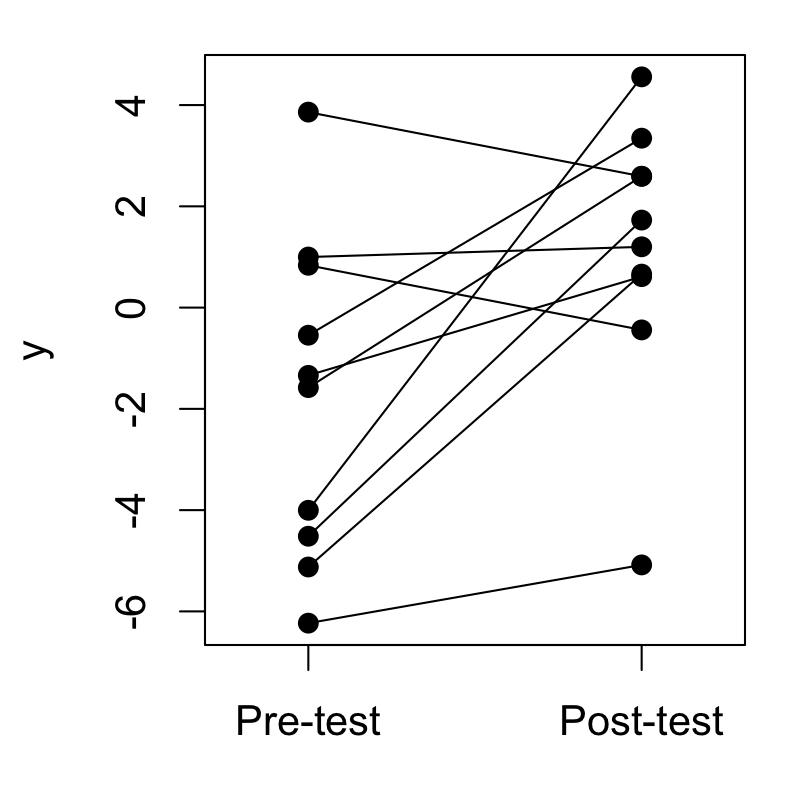 Glancing at the m-graph in Figure 2 we can see that the regression of Y on X does not meet Condition 2, because Y and remain d-connected through W, which is not in the set of predictors. So basically we have two options for how to proceed. The first and easier option is to consider instead a regression of Y on both X and W. Essentially, we decide that rather than seeking , the simple regression coefficient of Y on X, we will settle instead for , the partial regression coefficient that adjusts for W. In that case, Condition 2 is satisfied because this new predictor W d-separates Y from . So we could recover the coefficients from this new multiple regression simply by analyzing the non-missing observations at hand. The second option is for when we really do want and not . In the graph from Figures 1 and 2, there’s not really any good reason for preferring one over the other, since the graph implies that X and W are independent in the population and thus .3 So in that case we may as well just estimate , since that would satisfy Condition 2. But what if the situation were slightly different, say, with X being a cause of W? 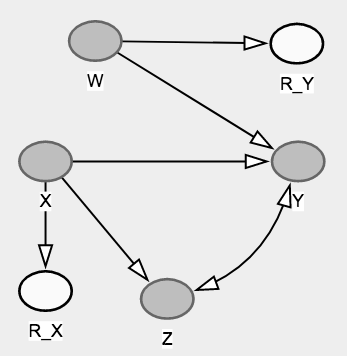 Figure 4: W is an effect of X.
Y is d-separated from the missingness nodes by the set of predictors and auxiliary variables . Furthermore, for any auxiliary variable that contains missing values, we can recover the coefficient from regressing on the predictors by Condition 2 or by a recursive application of Condition 3. In the present case, conditioning on the auxiliary variable W satisfies Condition 3 because (a) W d-separates Y from , and (b) W contains no missing values. Figure 5: The additive and interactive models have the same DAG, but is only directly recoverable in the additive model. The W=0 group (black) has no missing data, while the W=1 group (red) has 50% missing data. Open circles represent missing data points. For simplicity, Figure 5 considers an example where the auxiliary variable W is a binary dummy variable. In the additive example, simply analyzing the non-missing cases yields the same estimate (on average) as if all the data were fully observed—whether or not we condition on W. In the interactive example, the group with more missing data has a greater slope, so analyzing the non-missing cases skews the total estimate toward the group with the smaller slope. But by conditioning on W, we can either (a) recover the conditional effect of X on Y given W (through Condition 2) simply by analyzing the non-missing cases, or (b) recover the marginal effect of X on Y (through Condition 3) by taking a weighted mean of the regression lines at W=0 and W=1, with the weights proportional to the number of cases in each group prior to missingness (which we know, despite the missingness, since the missing values still have partial records on the other observed variables). While I generally agree that pretty much everything is fucked in non-hard sciences, I think the lessons from this analysis of missing data are actually quite optimistic. It’s often assumed that having data missing not at random (MNAR) basically trashes your analysis if a non-trivial fraction of data are missing, which is frequently true in observational data. But the necessary and sufficient conditions laid out here suggest that, in fact, the simple strategy of listwise deletion—simply “ignoring” the missingness and analyzing the non-missing observations that are at hand—yields robust estimates under a pretty wide range of missingness mechanisms. And even in a lot of cases where you can’t just ignore the missing data problem, you can often still construct a consistent estimate of your parameter of interest (as in Condition 3) without needing to use fancy procedures like multiple imputation or distributional modeling of the predictors. Even further, you may still be able to recover the parameter estimates of interest even if you can’t satisfy the sufficient conditions given here (as in the final example above). Finally, and more anecdotally, simulations I played around with while preparing this post suggest that, even when the regression coefficient of interest is not technically recoverable, the magnitude of bias is often small under many realistic conditions (see, for example, the magnitude of bias in the simulations of Thoemmes et al., 2015). 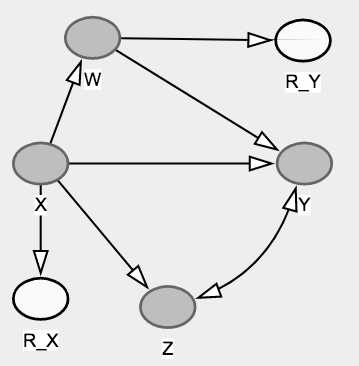 1 Recall that in DAGs, doubled-headed arrows like are just shorthand notation for , indicating an unobserved common cause L.
2 Rubin’s third type of missingness, missing completely at random (MCAR), would be represented graphically by the relevant missingness node R being completely disconnected from all other nodes in the graph. An example of this would be if we flipped a coin for each observation and deleted the corresponding value when the coin landed heads. Although commonly assumed for convenience, MCAR is not actually very common in practice unless it is deliberately built into the study design. 3 Actually, while this is true in the special case of classical regression, it’s not true in general. See this later blog post of mine that discusses the fact that this property doesn’t hold in logistic regression. Daniel, R. M., Kenward, M. G., Cousens, S. N., & De Stavola, B. L. (2012). Using causal diagrams to guide analysis in missing data problems. Statistical methods in medical research, 21(3), 243-256. Mohan, K., Pearl, J., & Tian, J. (2013). Graphical models for inference with missing data. In Advances in neural information processing systems (pp. 1277-1285). Mohan, K., & Pearl, J. (2014). Graphical models for recovering probabilistic and causal queries from missing data. In Advances in Neural Information Processing Systems (pp. 1520-1528). Thoemmes, F., & Rose, N. (2014). A cautious note on auxiliary variables that can increase bias in missing data problems. Multivariate behavioral research, 49(5), 443-459. Thoemmes, F., & Mohan, K. (2015). Graphical representation of missing data problems. Structural Equation Modeling: A Multidisciplinary Journal, 22(4), 631-642. As it happens, I’ve been meaning for a while to write a blog post on issues with computing d-like effect sizes (or other standardized effect sizes) for within-subject designs, so now seems like a good time to finally hammer out the post. Jeff didn’t actually say anything to restrict us to standardized mean difference type measures (as opposed to, say, variance explained type measures), and we can only guess whether the “correct” effect size he has in mind is a d-like measure or an -like measure or what. But here I’ll focus on d-like measures, which are perhaps the most popular for studies with categorical predictors, and offer plenty of complications that I think are often under-appreciated (and it seems Jeff would agree). 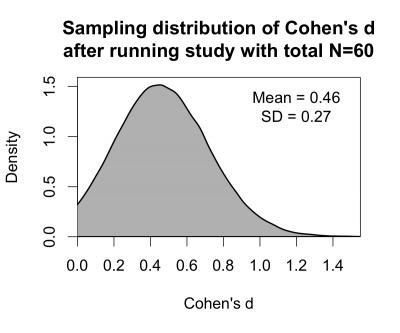 What I’ll show here is that there are at least 5 different and non-equivalent ways that people might compute a d-like effect size (which they would invariably simply call “Cohen’s d”) for Jeff’s dataset, and the resulting effect sizes range from about 0.25 to 1.91. I’ll compare and contrast these procedures and ultimately choose one that I think is the least crazy, if you must compute a standardized effect size (more on that later). When I read a paper that reports “Cohen’s d” for a within-subject design, I usually have no idea which of these 5 procedures the authors actually applied unless I try to reproduce the effect size myself from some of the descriptives in the paper, which is often not possible. The crucial thing to recognize about applying the classical Cohen’s d is that it deliberately ignores information about the design of the study. That is, you compute d the same way whether you are dealing with a between-subjects, within-subjects, or mixed design. Basically, in computing d, you always treat the data as if it came from a simple two-independent-groups design. I don’t want to get bogged down by a discussion of why that is a good thing at this point in the post—I’ll get into that later on. For now I just note that, with this effect size, within-subject designs tend to be powerful not because they lead to larger effect sizes—if anything, the reverse is probably true, in that people elect to use within-subject designs when Cohen’s d is particularly small, for example in many reaction time studies—but rather because they allow us to efficiently detect smaller effect sizes due to removing irrelevant sources of variation from the denominator of the test statistic. Richard Morey blogged about some weird things that can happen when you compute a standardized effect size this way. The basic issue is that, unlike classical Cohen’s d, does not ignore all the design information: will tend to be larger when there are more replicates, that is, when each subject responds more frequently in each condition. 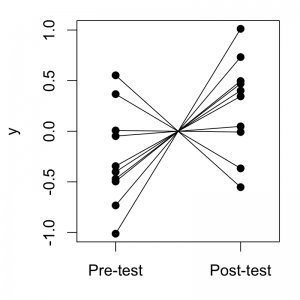 There is a straightforward relationship between and the test statistic: , where is the paired-samples t-statistic from a within-subjects design and is the number of subjects. One might regard this as a virtue of . I will argue below that I don’t think it’s a good idea to use . where is the independent-samples t-statistic for a between-subjects design and is the number of subjects per group. Many, many authors over the years have incorrectly assumed that this same conversion formula will yield sensible results for other designs as well, such as in the present within-subjects case. Dunlap et al. (1996) wrote a whole paper about this issue. One might suppose that applying this conversion formula to will yield , but we can see that this is not the case by solving the equation given in the previous section for , which yields . In other words, naive application of the between-subjects conversion formula yields an effect size that is off by a factor of . Finally, one can compute a d-like effect size for this within-subject design by assuming that the in the classical Cohen’s d formula refers to the standard deviation of the residuals. This is the approach taken in Rouder et al. (2012) on Bayes factors for ANOVA designs. In between-subjects designs where each subject contributes a single response, this is equivalent to classical Cohen’s d. But it differs from classical Cohen’s d in designs where subjects contribute multiple responses. #  Groups   Name        Variance  Std.Dev. The residual standard deviation is estimated as 0.20195, which gives us = 0.259. It turns out that, for this dataset, this is quite close to the classical Cohen’s d, which was 0.25. Basically, classical Cohen’s d is equivalent to using the square root of the sum of all the variance components in the denominator1,2, rather than just the square root of the residual variance as uses. For this simulated dataset, the two additional variance components (intercepts and slopes varying randomly across subjects) are quite small compared to the residual variance, so adding them to the denominator of the effect size does not change it much. But the important thing to note is that for other datasets, it is possible that and could differ dramatically. So which one should I compute? Basically all standardized effect sizes are just made-up quantities that we use because we think they have more sensible and desirable properties for certain purposes than the unstandardized effects. For a given unstandardized effect, there are any number of ways we could “standardize” that effect, and the only real basis we have for choosing among these different effect size definitions is in choosing the one that has the most sensible derivation and the most desirable properties relative to other candidates. I believe that classical Cohen’s d is the option that makes the most sense among these candidates. Indeed, in my dissertation I proposed a general definition of d that I claim is the most natural generalization of Cohen’s d to the class of general ANOVA designs, and I considered it very important that it reduce to the classical Cohen’s d for datasets like Jeff’s. My reasoning is this. One of the primary motivations for using standardized effect sizes at all is so that we can try to meaningfully compare effects from different studies, including studies that might use different designs. But all of the effect size candidates other than classical Cohen’s d are affected by the experimental design; that is, the “same” effect will have a larger or smaller effect size based on whether we used a between- or within-subjects design, how many responses we required each subject to make, and so on. 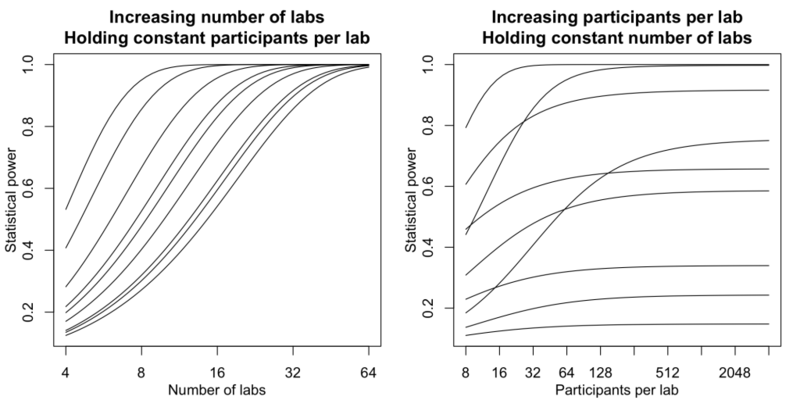 Precisely because of this, we cannot meaningfully compare these effect sizes across different experimental designs. Because classical Cohen’s d deliberately ignores design information, it is at least in-principle possible to compare effect sizes across different designs. Morris and DeShon (2002) is a nice paper that talks about these issues. Bakeman (2005) also has some great discussion of essentially this same issue, focused instead on “variance explained”-type effect sizes. 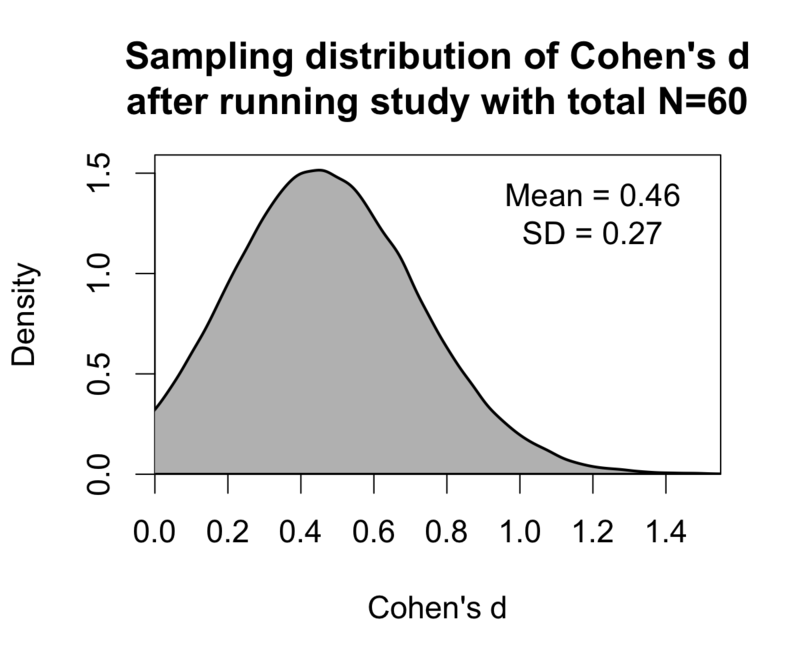 Although I don’t really want to say that there’s a “correct” answer about which effect size to use, I will say that if you choose to compute , , or anything other than classical Cohen’s d, just please do not call it Cohen’s d. If you think these other effect sizes are useful, fine, but they are not the d statistic defined by Cohen! This kind of mislabeling is how we’ve ended up with 5 different ways of computing “Cohen’s d” for within-subjects designs. Finally, there is a serious discussion to be had about whether it is a good idea to routinely summarize results in terms of Cohen’s d or other standardized effect sizes at all, even in less complicated cases such as simple between-subjects designs. Thom Baguley has a nice paper with some thoughtful criticism of standardized effect sizes, and Jan Vanhove has written a couple of nice blog posts about it. Even Tukey seemed dissatisfied with the enterprise. 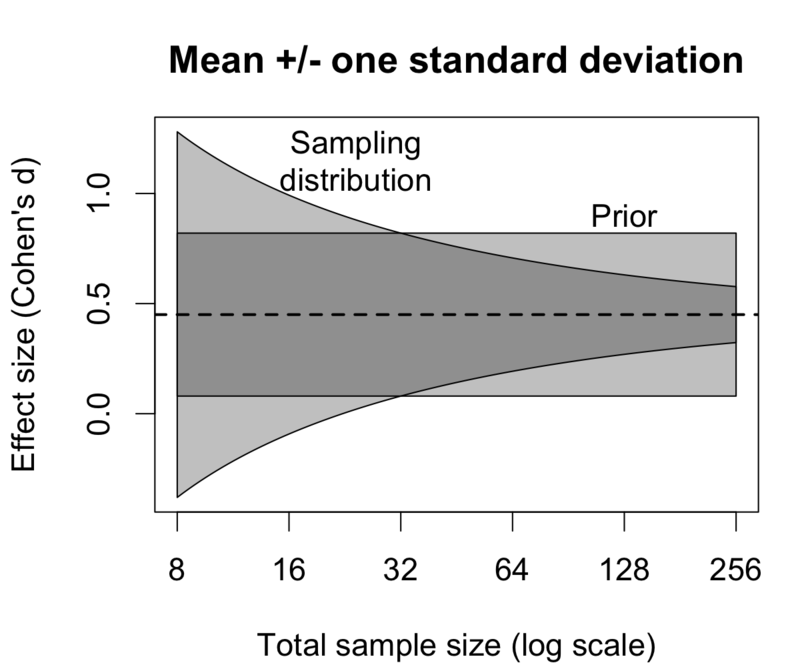 In my opinion, standardized effect sizes are generally a bad idea for data summary and meta-analytic purposes. It’s hard to imagine a cumulative science built on standardized effect sizes, rather than on effects expressed in terms of psychologically meaningful units. 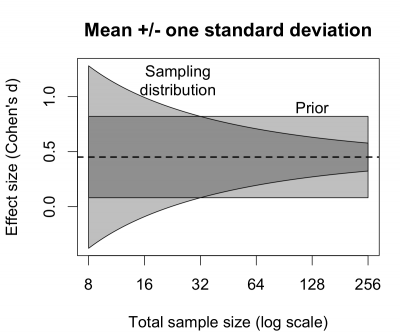 With that said, I do think standardized effect sizes can be useful for doing power analysis or for defining reasonably informative priors when you don’t have previous experimental data. 1 In general, this is really a weighted sum where the variance components due to random slopes must be multiplied by a term that depends on the contrast codes that were used. Because I used contrast codes of -1 and +1, it works out to simply be the sum of the variance components here, which is precisely why I changed the default contrasts before fitting the mixed model. But be aware that for other contrast codes, it won’t simply be the sum of the variance components. For more info, see pp. 20-21 of my dissertation. 2 If you actually compute classical Cohen’s d using the square root of the sum of the estimated variance components, you will find that there is a very slight numerical difference between this and the way we computed d in the earlier section (0.2498 vs. 0.2504). These two computations are technically slightly different, although they estimate the same quantity and should be asymptotically equivalent. In practice the numerical differences are negligible, and it is usually easier to compute d the previous way, that is, without having to fit a mixed model.